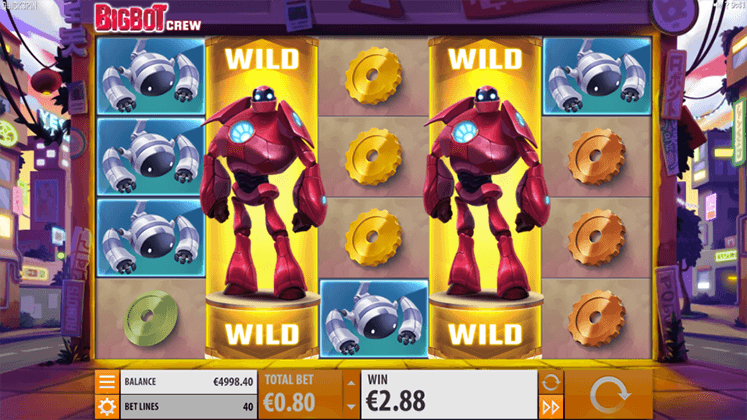 BigBot Crew is a 5 reel and 40 paylines video slot, powered by Quickspin software provider. Video slot have a unique theme, you will be transported to the feature where super genius teens are building awesome robots of the future. Design of the slot is colorful and high quality. In addition, you will be transported to the city of the future. 4 different colored Cogs are low paying symbols, whereas 2 robots and 3 main teens are medium and high paying symbols. In addition, Wild and Bonus Scatter symbols are available as well. Before investing real money players can try BigBot Slot for free, or visit any Quickspin casino such as: King Billy Casino, Columbus Casino, PlayFortuna Casino and others to play with real money and win. RTP is currently 96.58%. Before you go and explore the city of tomorrow, you need place your bet. Using “Total Bet” button you can adjust you coin value which goes from 0.005 to 2.5. By using “Autoplay” you can choose the number of spins that will go without interrupting. Big button with the arrow inside is a “Spin”. Wild symbols appear only on the 3 middle reels during main game, and in addition, 2 more Wilds can land during bonus game. Big Bot wild can cover whole reel. When all 5 Wilds land you will win x10 of your stake. BigBot Re-Spin feature activates when you land 2 or more full BigBot Wilds. Number of the re-spins you will get depends on the number of Wilds you land. In addition, if another full Wilds land on the reels during the feature you will get more re-spins. Free Spins feature is triggered when 3 Bonus Scatters symbols land on the reels. You will get 8 Free Spins and if you land additional Wild symbols during this feature you will get extra spins.